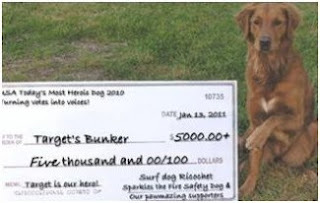 SAN DIEGO, CA, January 31, 2011… More than $5000 has been raised for Target's Bunker in a fundraiser that came out of USA Today's Most Heroic dog of 2010. Surf Dog Ricochet, the SURFice dog, and Sparkles the Fire Safety Dog were among the five nominees, along with Target, the Afghanistan dog who saved many soldiers lives, only to lose hers to an erroneous euthanization. 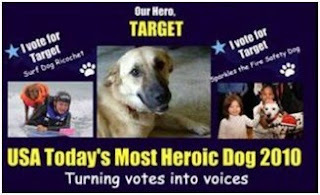 Ricochet & Sparkles turned their votes into voices for Target, and began raising funds and awareness for her.On January 7th, Ricochet and Sparkles asked their supporters to turn their votes into voices during USA Today's Most Heroic Dog of 2010. In addition, they started a fundraiser to help Target's Bunker, an organization founded by Target's family. Donations came in from all over the country. Thanks to their generous donors, $5074 has been raised. Target saved the lives of many soldiers in Afghanistan when a suicide bomber walked into a Border Patrol compound. Target, along with two other stray dogs, attacked the bomber. Despite the bombing... she survived. SGT Terry Young adopted Target, and brought her back to live with him in Arizona. One Friday afternoon, Target got out of the yard, and ended up in a shelter. Tragically, by Monday morning, she was erroneously euthanized. Target's Bunker has been formed with the hope of keeping another tragedy like Target's from happening ever again. Ricochet and Sparkles believe thousands and thousands of dollars can be raised for hero dog, Target, and ask folks around the world to join their quest by making a donation, and/or help raise awareness by getting the word out about their initiatives... which will ultimately save lives.